Awesome adaptations, Jacqueline. I love everything that you added! They turned out beautifully…so impressed that you do it all GF! Oooh the granola and cookie crumbs sound like delicious additions! I also want to try your popcorn suggestion…mmm… And I TOTALLY agree. These are crack cookies! I couldn’t stop eating them! What’s up with this ‘g’ measurements? I am a silly American. Don’t know nuthin’ about the metric system. But I will be a good sport and break out the scales for this because they look expecially good! I stand by weights when it comes to most gluten-free recipes. Changed my perceptions and accuracy when I got a scale, and they’re totally not an expensive addition. I highly recommend it – makes adapting recipes exponentially easier. Thanks friend! You just shoot my your digits and I’ll send you and the lady some the next time I whip them up (literally, I’ve shipped to friends in the UK before). Yum!!! I will try these soon. I love this kind of scary! Love all of your substitutions too. These cookies look insanely good!! I would be addicted in a heart beat! What great changes, these look great! Love the idea of a recipe that uses up all the little bags in my pantry. 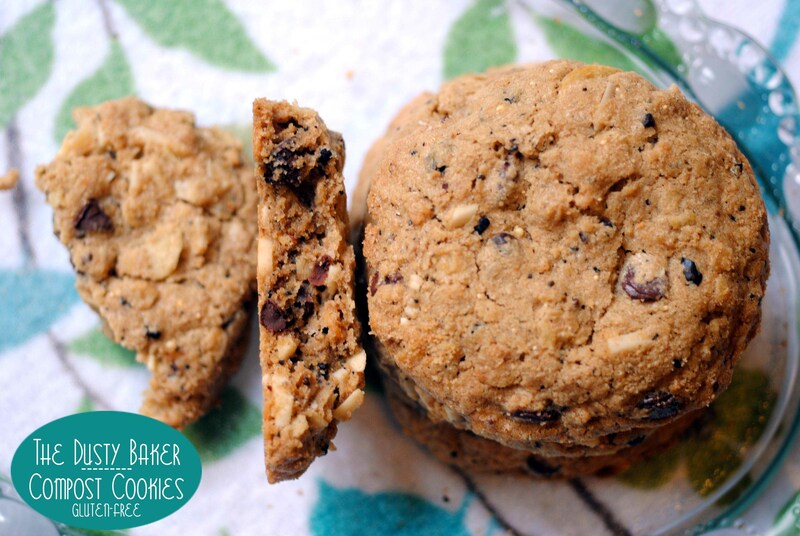 I love a crisp yet chewy cookie and these look perfect! I bet they’re a bit of sweet-salty heaven. They were almost eerily perfect. My favorite cookie to date, by far. Thanks for saying hi! I’ve been meaning to make these cookies! Gosh, I just adore every recipe from this book. Your version looks FANTASTIC. Have I ever told you that I have no clue how you bake the stuff you do (especially considering that it’s all GF?). You are one talented lady. Aw, thanks darling. It’s second nature now. If I take a new chef gig I’m going to have to remind myself how wheat flour and cow’s milk work!!! My question is – did you use the glucose and what does it do for the cookies? I can’t get it and don’t feel like ordering it just for one recipe. Can I use honey instead since it is also a mixture of fructose and glucose? Isn’t it similar enough? Or can I use agave nectar? I used molasses instead and corn syrup is listed as an option. I’d suggest trying glucose at some point just for the fun of it. It’s thicker than corn syrup and does provide a different texture. I was so happy with the way these came out though that I’m sticking with this recipe. Wow! These cookies are a MUST! At first thought, the potato chips are a little strange, but I can imagine the little taste of salty goodness they bring to each bite. Can’t wait to make these!! They.Are.So.Good. I have a bag of frozen cookie pieces in my freezer for a future recipe and even just two little nibbles sends me flying in a sugary, cracked out state of ecstasy.